When April, with its sweet showers has soothed March’s deep-rooted drought, pilgrims descend on London, the tired, the hungry, the ill-shod, full of longing and apprehension, they swell towards the Excel centre, then again at Blackheath, in search of joy, redemption, absolution. They clutch their energy gels in their hands like pardons, their hearts beat as in their heart of hearts they confront the almighty. It is time for the London Marathon, and this year marks the 100th anniversary of the distance being established at 26 miles 385 yards – prior to the marathon in the London Olympics of 1908 the distance had been a long race of about 25 miles … you know the story about Queen Alexandra wanting to see the finish outside the palace. 2008 has been a good year for Welsh sport. First the well-deserved Grand Slam in the Six Nations rugby union championship, then the bizarre progression of Cardiff FC to the FA cup final (when I didn’t know there were eleven – is that the right number? – people in Wales who know the rules for football). But my running does not form part of this picture. Instead it has been a year of retreating from light drizzle, of contemplating fine wines, of reading and writing and generally shrinking from the field where glory is sought, not without dust and heat. Odd then to find myself at the green (fast-for-age and celebrity) start at the Flora London Marathon this past Sunday, next to Sean, perennial daemon, and to Ned Boulting, host, self-styled minor celebrity and significant fundraiser for ECHO (see here for ECHO, and here for his hospitality last year). If I was in poor shape, Sean was possibly worse off, untrained and vying with Meike for that seven-months pregnant look. Looking in fact like foie gras, of which I understand he has eaten a good deal recently, along with a number of French regional wines. Elias and I collected my number at the Excel expo, met up with Jon “Hero” Crannage and Sarah “Squealer” Crannage (Saturday Striders pseudonyms) and we all headed off to Ned’s in Woolwich. Ned and Kath’s house is brilliant. It’s like a rural farmhouse in Woolwich, full of comfort and nice floors and warmth and character and the smells of cooking. Elias loves it: he thinks it’s happy living without ostentation (I think those were more or less his words). Kath had cooked up a storm with her mother-in-law Juliet, and we ate pasta until we all looked a bit like Sean. Suzy and Edie had painted a banner with their mum, to support not only their dad but all of us sorry marathoners who had descended upon them that weekend: all the above-mentioned plus Ned’s old friend Simon, a spry triathlete who had trained, his neighbour Graeme and others I didn’t meet. 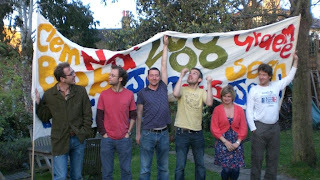 You can see it in the photograph, accompanying (right to left) Sean, Sarah, Jon, Ned, Simon and me. It choked me up a little seeing it. Family life is different when your parents are young anarchists in Tiger Bay in the heady ’60s, and when you’re not a single dad. Elias and I slept in the living room, and my head was full of quiet thoughts of the dawn. I love marathon dawns. Someone should write a book about them. Coffee never tastes better. You have just the one cup, lest you end up peeing too much, but it’s always a great cup. Wearing half a tracksuit you force yourself to eat porridge as the sun rises, with your safety pins and race number in front of you. You know it’s coming at you and there’s nothing you can do but save adrenaline and give in to the wait for that starting horn. You live in a perfect balance of wellbeing and trepidation. Gradually people come and go in the kitchen. It gets light. You watch the minutes go by, visit the bathroom frequently, think abut pinning your number to your shirt. Someone puts motivational music on the stereo (but Dr Hook, Ned?) Then it’s time to vaseline up, pack your kit bag, and head to the start. Ned and I walked a couple of miles through the cold brightness to Blackheath and to the green start. I received a bunch of misdirected texts from people I didn't know who can't spell. We met Sean there; Sarah and Jon and Simon were at a different start. You know the rest: toilets, bag check, starting pens, the rising storm of excitement, checking out the other runners. The start and holding yourself back, suppressing that urge to run how you feel, which would be much too fast. Ned, running his first marathon, had set himself a target of 3:45, and Sean and I planned to run with him, hoping that 26.2 miles without real training wouldn’t leave us crippled. We wound through the April streets, manifesting the support that London always provides, cheers, bands and beer. 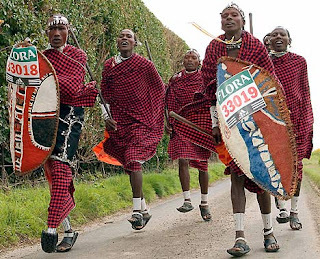 Soon we found ourselves behind the Masai warriors, raising money for a water supply to their Tanzanian village, with car-tyre tread strapped to their feet, carrying spears and shields. We ran with them for a mile or so. They were chanting and dancing and generally expending energy doing things that weren’t running. I moved on after I almost lost an eye for the second time. It was a bright and beautiful morning, perfect for running. We passed Elias and Suzy and Edie and Kath holding their banner and cheering. There was nothing wrong with this picture. It was shortly after this that Sean discovered that he needed a toilet break. But we didn’t spot any toilets for a while. This was the reason he disappeared into a dodgy-looking pub in Deptford. I prayed that he didn’t start an argument over any bills involved. We didn’t see him again for quite a while. We are still trying to establish the precise sequence of events. Ned and I trudged on at about 8’25” to 8’35” pace, which would bring us home in requisite time. I love running. I’ve really missed it. I love races too. I love drinking Lucozade to keep you buoyant during the long middle miles. And the comfort of energy gels. There were more supporters: Meike, whom I missed, Juliet and Norry, Ned’s parents, whom I missed, Glenn Tilbrook (yes, of Squeeze fame), who’s a friend of Ned’s, and Nicky, a friend from Cambridge, who brightened Commercial Road, usually the dullest part of the race. Plus lots of people who called out Ned’s name, no doubt because it’s easier to pronounce than mine. As we headed towards Tower Bridge, the skies opened. We were soaked, cold (I hope the people running in underwear were suitably punished) and heavy-shoed, running into the wind. That was the only point at which I wished I was running faster. We went over Tower Bridge, which was such an enormous boost, a mainline injection of adrenaline and good-feeling. I couldn’t see anything until I realised I was still wearing my wrap-arounds in the downpour. The gang waited for us with their vast banner at another point on the route, about 15 miles, but found the banner was dripping paint over other spectators. For some reason I kept on hearing the crowd repeatedly shout “go, toilet”. I pondered on this for a while. Then I became intensely worried that Sean, who still hadn’t reappeared, had for some reason been forced to escape from his Deptford pub with the toilet, or that the toilet had been wrapped around him in some way, which would explain why it was taking so long for him to catch up. Then the toilet passed us, and it was only a guy in fancy dress, and soon Sean reappeared, without a toilet. Ned was doing well. He was pushing the pace, feeling good. He went ahead for a while. He didn’t seem apprehensive. He didn’t know what was coming. At about 22 miles we passed Jon and Sarah. They were also aiming for 3:45, but Sarah was flagging. Ned didn’t begin to really suffer until shortly after this. His head went down. His face turned red-orange. His eyes looked like they were going to pop out in disgust. But he more or less held the pace with exemplary determination. Sean and I adopted the pacers’ role, sitting in front of him, urging him on. We were probably very culpable in our smug encouraging remarks. But before long Big Ben was in sight. We entered the uncountable series of turns that comprise the palace gardens and the home stretch. And still they came! How does it feel to be part of that great sea of humanity, everyone with his or her own story? To be among the tired, the poor, the hungry, the chafed and bleeding? How does it feel to live in the imaginary centre of those tv commentators’ clichés? Just fine. We hit the sign that marked 800 metres to the finish. We ran for what seemed like a kilometre. Then we hit the sign that marked 600 metres to the finish. Then eventually the finish line came into view. Ned started pumping his arms. We fell in behind him. At the finish we took hands, and crossed as finishers numbers 7637-39, in 3 hours, 45 minutes and 47 seconds. As we came to a halt a race marshal instructed Sean and I to hold Ned up, as he didn’t look very good. Soon he was fine though. 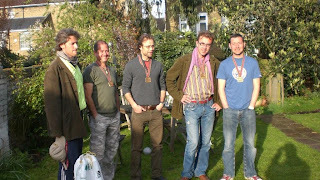 We collected our medals, met up with friends, were once again soaked in a fierce downpour. Ian Chanty, of Berlin and Saturday Striders fame, was there: he’d missed another sub-3:00 by a handful of cruel seconds. He treated it with Roman fortitude, notwithstanding the rain. We didn’t see Pietro, but he’d achieved 3:00 with a few seconds to spare. 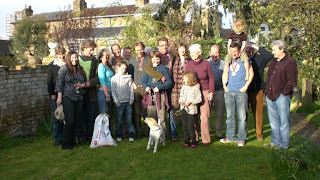 Then headed back to Woolwich, where we were feted with family compassion and lots of food and wine. See grand family picture, missing Kath behind the camera. Simon had missed his three-hour target by a couple of minutes. Jon and Sarah had run the race 12 seconds faster than us (they must have started out behind us in time, as they were at the mass start). Martin Lel had set a new course record. We ate and ate and drank wine and were photographed again, with medals and then with family and friends, including Jon and Jane, last year’s co-hosts. You’ll see Elias holding Pops, Suzy also in front, Edie perched on Ned. Elias is planning on running London soon he tells me. Ned described the experience as horrible, surprisingly horrible, indescribably horrible and more horrible than he’d imagined. Nonetheless he made his target, struggled through the pain and desperation to finish despite an injury sustained during training, and he will now be a shining light to other first-timers, and a credit to ECHO. Sean and I hope to persuade him to come back next year; and we’re working on Jon and Jane. This was the first day in our next campaign. Maybe Welsh sporting victories will pick up again in the autumn. I've got a comment. I've got many, in fact. But I fear for them, and suspect they may feel tired and worn and dispensible and cliched, and that they might hit the tarmac like any number of discarded Lucazade pouches. The thing is vast, and, once viewed from the inside, can not easily be forgotten. I thought I could run closer to 3.30. I was shocked and humbled by my incapacity. Now, 3 days after the event, the "euphoria" (such as it was)has given way to navel-gazing. I wonder about stuff. But Joad, for a man I know little, you have carved out a very distinctive niche in my experience. You ran alongside me for 26.2 miles one day in London, and helped me achieve a cliche. And Sean would've been there too have he not needed a dump in Deptford. Thanks to you both. I'll never forget it. Next April, which is and always will be the cruellest month, my memory will not be mixed with desire....it'll be mixed with Claret as I imbibe, and you munch Pasta. Enjoy!